NutriPak Protein Meal is a ready-to-eat meal in a hermetically sealed container with a fork attached. It contains high-quality meat rich in well-absorbable proteins, as well as balanced carbohydrates with different glycemic index, providing energy immediately after consumption and for a long time after. The diet of both a professional athlete and a sports hobbyist should abound in proteins because it is a macronutrient that builds muscle tissue and is also necessary for its reconstruction. It is important that the protein provided with meals has the appropriate aminogram, that is the composition of amino acids present in the product. It is the aminogram that determines to what extent the protein will be useful for the body to build its own tissues. Proteins contained in meals created by Nutripak come from chicken or beef, i.e. meats that are characterized by almost an ideal aminogram. 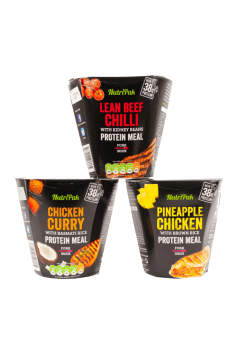 What's more, each pack contains almost 40 grams of protein! Therefore, these ready-to-eat meals work well after training, when there is a need to provide high-quality ingredients so that the regeneration process occurs correctly. During a physical effort, the body derives energy from glucose or from back-up fuel – glycogen, which is why it is so important that the diet of an active person is rich in carbohydrates. This product contains sources of both simple and complex carbohydrates, thus providing a dynamic flow of energy that will last several hours. The sugars present in these ready-to-eat meals come exclusively from natural products such as fruits and honey. These ingredients not only provide good quality sugars, but they also provide a whole range of other important micronutrients and enzymes, thus supporting the functioning of the system. On the other hand, complex carbohydrates found in the dish come mainly from brown rice, characterized by a low glycemic index (GI), which ensures satiety and stable glucose for a few hours after consumption. This product contains minimal amounts of fat, most of which are unsaturated fatty acids. This type of fat guarantees that the meal does not stay in the digestive system and is easily digestible. This type of combination is also beneficial due to the content of simple and complex carbohydrates, which could be less absorbed by excessive amounts of saturated fat. The meals have been closed in special packaging with a fork attached, which makes them convenient to eat in any situation. What's more, they taste great both hot and cold. It is also worth mentioning that the NutriPak dishes retain freshness and taste even when stored outside the fridge. Owed to a balanced composition, this product will be great at any time of the day, without wasting time for earlier preparation. It works both as a typical dinner dish, supper or post-workout meal. It will always taste great – regardless of the cooking skills of the consumer. In summary, NutriPak Protein Meals are the products of excellent taste, great quality, and balanced composition, addressed to people who do not have time to cook, and yet want to stay in good shape and health. These dishes provide available on hand wholesome proteins, various sources of carbohydrates and minimal amounts of fat. All you have to do is to open the package, remove the fork and start consuming. The meal can be eaten hot or cold, but if you like it hot, peel the film partially and heat for 1 minute on full power. This product is aimed at people who, despite their busy lifestyle, do not want to give up healthy and balanced nutrition. You can eat it at any time without worrying about digestive problems, bloating or even discomfort. NutriPak is a company offering a wide range of meal replacements. It was created in response to the needs of people living on the run, burdened with excess duties, having a small amount of time, who have the ambition to eat healthy food and give up controversial fast-food meals. Meals offered by NutriPak are perfectly balanced, contain only natural ingredients, are free from wheat, preservatives, artificial colorings and flavors. They are characterized by increased protein content and low-fat content. They are available in many attractive flavors. All meals offered by NutriPak can be consumed immediately after opening the container. They are also suitable for heating and consuming hot. For the maximum consumer convenience, each container comes with a fork. *The nutritional value may vary depending on the flavor version. Chicken Curry: Chicken 33%, Water, Cooked brown basmati rice 21,7%, Onions, Peppers, Grapes, Apple, Curry spices 0,79%, Modified corn Starch, Modified tapioca starch, Salt, Coconut cream (coconut cream, maltodextrin, sodium caseinate), Honey, Spice. Lean Beef Chilli: Water, Beef 23%, Tomato Paste, Precooked Red Beans 6,6%, Soy Protein, Tomatoes, Onions, Peppers, Honey, Vinegar, Salt, Spices (Cumin, Paprika, Pepper), Garlic, Paprika Extract. Pineapple Chicken: 33% chicken, precooked brown rice 22% (Brown rice, water), water, onion, sugar, pineapple, carrot, tomato paste, pepper, celery, crushed tomatoes (tomatoes, tomato juice, E330, E509), vinegar, salt, manioc modified starch, corn modified starch.